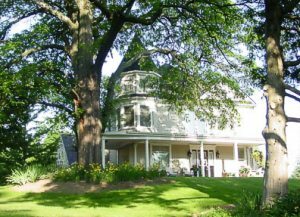 Everheart Country Manor is a beautiful restored century home with a view to the Niagara River. It features three luxurious suites all having Jacuzzi tubs, fireplaces, TV and A/C. Relax in the guest lounge with wood burning fireplace or take a dip in the indoor pool. The manor with its wonderful front porch located atop a hill on two acres of private gardens, beckons guests to relax, stroll, or just lounge on one of the decks or patios. Each morning enjoy a scrumptious full breakfast in our elegant dining room. Everheart, just a short drive down the beautiful Niagara Parkway in charming historic Queenston, is centrally located between Shaw Theatres, shops, the Casino and Niagara Falls. We are smoke free, however smoking is permitted outside on the deck or patios.